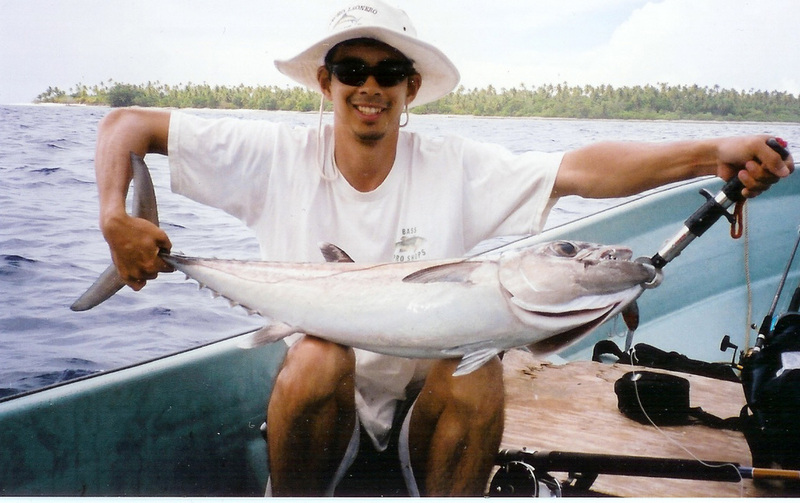 Dogtooth Tuna are a fantastic gamefish found in the South Pacific and the Indian Ocean. They have a wicked set of teeth and frequently bite through thick leaders. They generally live near reefs and are adept at bricking anglers in the rocks. Dogtooth Tuna attain weights of over 200lbs although I’m told that fish of that size require a lot of luck to land. They are one of this planet’s great gamefish. I haven't caught many of them but I've done a decent amount of research on them. I’ve never landed a large one but it’s on my list. The large ones I've hooked have all broken me off or been eaten by sharks which is unfortunately all too common. Dogtooth Tuna are generally caught either trolling or jigging. For trolling for large ones a 50 W type trolling outfit with 100lb braided line is not overkill at all. 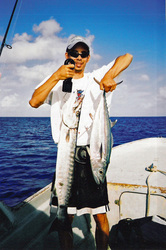 For jigging, there are a number of specialized jigging rods from Japan that are light but can handle big fish. These rods are not cheap. Make sure you use a wire leader. Click here for tackle recommendations. Dogtooth Tuna can be caught with bait and lures. A big live bait or a trolled lure on a heavy conventional setup gives you the best chance to land a really big one. However, most people prefer to catch them by casting or jigging. Dogtooth Tuna can because caught trolling Rapala type lures. Troll on the outside of the reef and in the channels between reefs. Dogtooth occasionally take poppers on the surface. 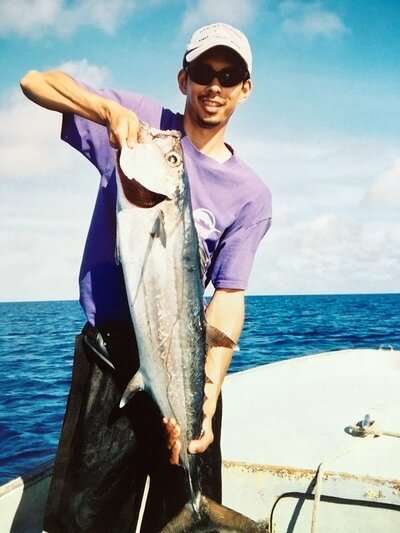 I hooked one on the Great Barrier Reef on a Heru Cubera 125 popper but it was eaten by a shark. There are a number of jigs that people use for these, mostly from Japan. I haven’t fished them enough to recommend any but there is some good info on the sites below. Jigs probably catch more Dogtooth than any other artificials. The problem is that if you hook them deep it is easier for them to brick you in some rocks. I have never caught a Dogtooth Tuna on bait but I’ve read they will take a variety of live baits which makes sense. The Coral Sea has some huge ones. Some big ones are also caught off the coast of Tanzania. They tend to be found in remote areas.